It’s a topic rarely covered in a public health classroom, but hopefully, one day it will become more common. 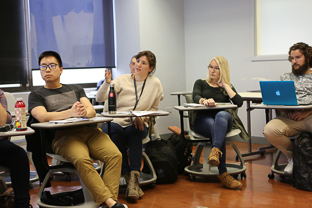 Columbia Mailman School’s “Gun Violence in the United States: Evidence and Action,” one of the country’s few public health courses on preventing firearm injury and death, invites students to examine the science on gun violence within the political and legal contexts that support or stymie collective action. On a recent Monday afternoon, Ted Alcorn, one of the course’s instructors, told the class a tragic story of a young woman who was about the same age as the students when she was shot and killed by a former boyfriend. The tragedy, which was devastating to her family and friends, is unfortunately just one part of a national picture of largely unchecked violence, dominated by firearms. At the Monday afternoon class, Alcorn described the murder of the young woman, students reviewed a collection of studies on intimate partner gun violence, which like every other type of gun violence is a far greater problem in the United States than in other comparable countries. Unlike other gun homicides or gun suicide, in which men are more often the victims, domestic violence homicides disproportionately affect women. Nationally, half of women killed by guns are killed by intimate partners and family members. When an abuser has access to a firearm, his partner is five times more likely to be murdered. 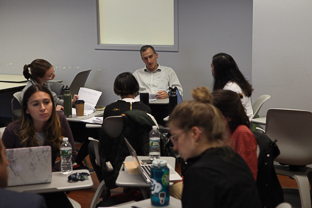 Charles Branas, chair of the Epidemiology Department and the course’s co-instructor, invited the class to take a close look at a 2003 research study that identified risk factors for female homicides in the context of abusive relationships, including the perpetrator’s access to a gun. 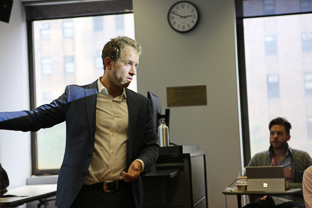 He asked students to consider questions: how the study was designed, how terms like domestic abuse are defined, and what conclusions can be drawn from it. Perhaps the biggest takeaway: guns are highly lethal. “It may seem obvious,” said Branas, “but in situations where guns are present the chances of dying are excessive and we seem to overlook this.” Groups working to prevent domestic violence have used evidence like this to restrict abusers’ access to guns as a top priority. For more than a decade, Branas’s own research has challenged conventional thinking, presenting evidence that the risk of gun death is disproportionally high in rural areas, where suicides are the biggest contributor, and actually at higher rates than urban areas where homicide risk is more common. His research was cited in the landmark 2008 Supreme Court decision, District of Columbia v. Heller that upheld the individual right to possess firearms but affirmed the constitutionality of reasonable restrictions. In another prominent study, he found that people who carried guns were more likely to be shot than those who were unarmed. In recent years, even as federal funding for gun violence research dried up, his research has continued, zeroing in on creative ways to reduce urban gun violence by restoring vacant and abandoned spaces in cities. Through the fall, the Columbia Mailman course covers gun violence from multiple angles: the beliefs and behaviors that constitute American gun culture; the roles played by government, the legal system, and mass media; and various interventions aimed at prevention. Along the way, students, whose interests span injury prevention, chronic disease, and health policy, write briefs as if they were outlining the issues for policymakers, drawing on the best available science to support their positions. 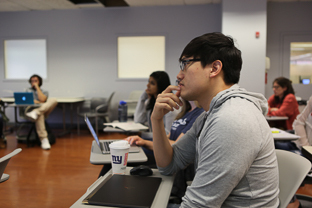 Justin Lee, an MPH student in Epidemiology, relishes the opportunity to pull back the curtain on gun violence.